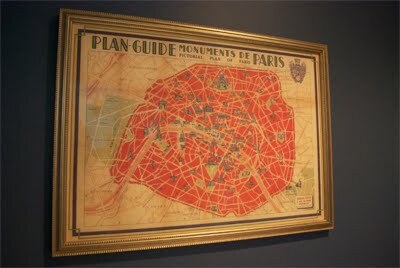 I told ya I was going to show you the Paris map once it got adorned with the right frame! I was able to find a frame at Michael's since they were having a 50% off custom frame orders sale. 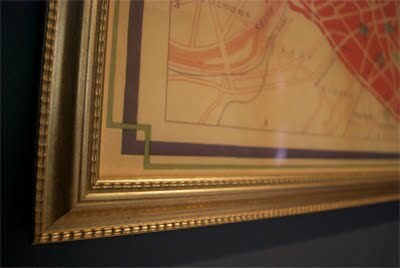 I don't even want to know how much it would've cost had I gone to a frame specialist downtown (Annapolis) since this frame wasn't exactly inexpensive. 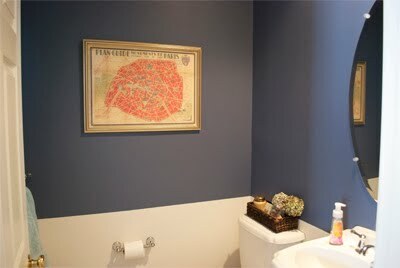 BUT it was worth it since now it's hanging in the powder room looking fabulous. I know, I know, there's still no chair rail in this bathroom and when did I say I was going to finish it? I only have myself to blame but it'll eventually be added, promise! Remember how I said in the recent Dining Room post I did that I wasn't finished decorating it just yet? 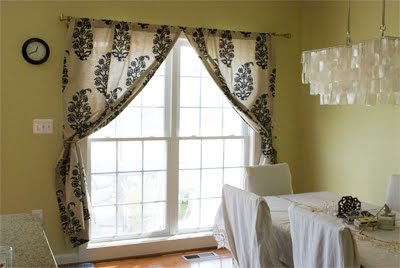 Well, not that I am, but we added curtains to the windows about a month ago (yes, I totally forgot to write about it and show you!) and I am finally getting to show you all what it looks like. And I have to say it looks pretty darn good, if I do say so myself. 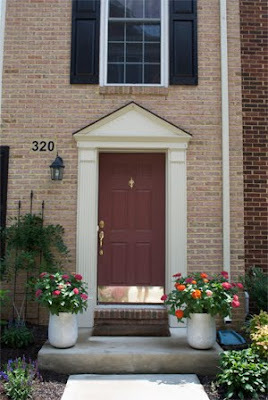 Concorde Medallion Panel from Ballard Designs, $69-$89. I don't know if I mentioned this in my Floor Sample Sale post, but when we purchased the Paterson White Media Console we also purchased the Sloane White 18" Leaning Bookcases as well to flank the console. I was a little worried about it since I wanted bookcases with backs to flank the console, but it turns out that the leaning ones work better than what I had envisioned. Without the backs, it lets the beautiful blue paint color come through, and it also allows for any accessories on the bookcases to really stand out which is what my goal was for the bookcases. 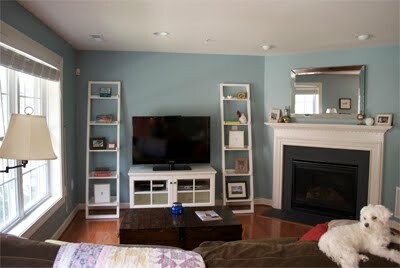 *See a 'Before' shot of the same room with a darker media console. And the last improvement we literally just did (yesterday and this morning) would be our garden in the front of the house. Our hydrangeas have been looking a little pathetic (no thanks to us for not taking care of them as well as we should have) so we decided to get them healthy again and to add some new flowers for more color. 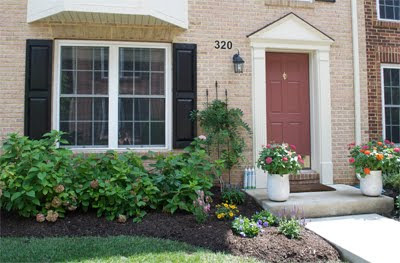 We also thought it would be nice if we framed our front stoop (I can't think of any other euphemistic word for stoop) with some potted flowers. We went to this place called Homestead Gardens to pick up the flowers, mulch, potting soil, and the pots but the pots they had were just way too expensive ($100 and upwards for a flower pot!). So, I told my husband let's wait until I take a trip to HomeGoods tomorrow morning to see if I can find any flower pots there that would be more affordable. 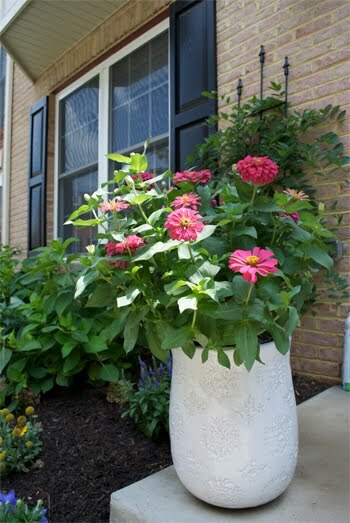 I'm so glad we waited because we got 2 unique flower pots for a steal ($24.99 each), well at least compared to the Homestead Gardens ones. Our stoop looking so much lovelier with the potted flowers. A closeup of the unique flower pot. That's all of the improvements done in the past 1-2 months and hopefully there will be more coming up. I'll keep you all posted with our progress! ohhh...your redecoration and redesign looks wonderful so far!!! !